Blackpool’s chairman Karl Oyston has today attempted to defend paying £11m to his father Owen Oyston, who is also the club’s majority shareholder, for being a director in the season Blackpool were relegated from the Premier League. 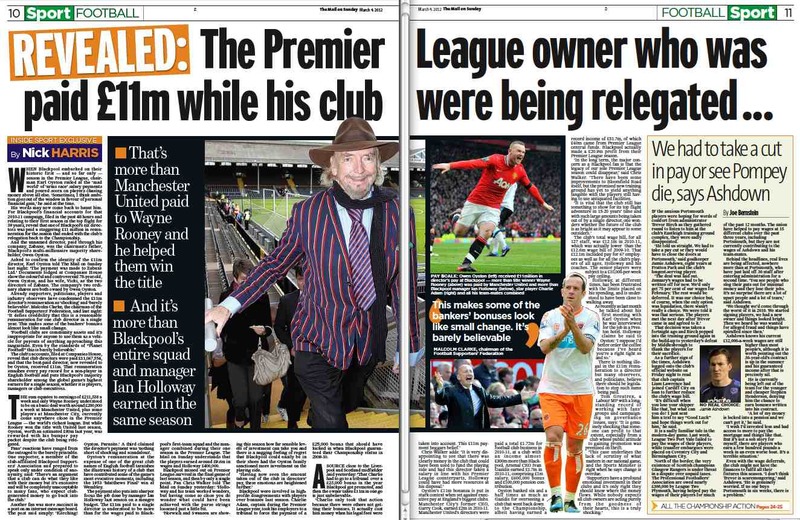 The full story about the payment was in the Mail on Sunday yesterday (left, and linked here), and has led to almost unanimous criticism of the Oystons by fans of the club, politicians, supporters’ organisations and, privately or via associates, by players. The £11m sum equates to earnings of £211,538 a week and as such put Owen Oyston among the highest earners in world football in 2010-11, a season that ended with Blackpool’s return to the Championship. The £11m – paid to Zabaxe Ltd, one of many companies owned by Owen Oyston – was not for the repayment of any specific loan or investment in Blackpool, a club he has owned since 1987. It was a straight cash payment for being a director for a year. An interview with Karl Oyston in The Gazette newspaper in Blackpool has been published today. For now it is only available in full to those who buy the paper, although it will be online in full later. Extracts and summaries are already appearing on message boards. Sportingintelligence has seen the contents, which can be summed up as Karl Oyston arguing his dad is a genuine fan who saved the club in 1987, who has lent (nb: lent) money to keep it running, and who doesn’t deserve criticism now. Oyston Jnr gives no details of his family’s net financial contribution to the club, and intimates that the £11m is better off in the hands of his father than being spent on players and agents. 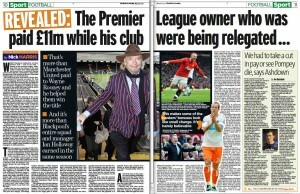 A minority of fans have argued in the past 24 hours that as Owen Oyston owns the club and has helped to sustain it since the late 1980s, he is entitled to do what he pleases with record earnings amassed from the Premier League season. Without detailed access to every transaction in the past 25 years, it is impossible to know what the Oystons net contribution has been in that time. However, taking reported figures relating to transfer dealings over that period, Sportingintelligence estimates the club has made a net profit from transfers of around £6.5m between 1987 and now. And looking at headline club profits and losses each year – which have tended to be mostly losses in the hundreds of thousands per year, and occasional profits – the club lost around £8m in normal trading in the Oyston era up to 2008-09. In other words, factoring in trading losses and transfer profits, it doesn’t appear there has been net investment of many millions over the period, and perhaps none at all, net. The accounts for Blackpool’s parent company Segesta for 2010-11 show details of grants given to the club to improve facilities, including £2,450,000 from the Football Stadia Improvement Fund, which is being amortised over a long period from 2002. In the year 2009-10, Blackpool posted a loss of £6.7m in the promotion season (mostly bonuses, paid on the basis of the Premier League bonanza ahead), and then posted £20.9m profits for the 2010-11 season, even after the £11m payment to Owen Oyston. On top of the £11m in 2010-11, it seems that Owen Oyston has also been paid £6.5m by Blackpool FC for some land he bought from the club for £650,000 some years ago. Of this £6.5m, a sum of £4,899,000 was paid by the club to Oyston in the 2010-11 financial year, and the balance by 30 August 2011. Crudely, and not taking into account any management or development costs, it seems Oyston has made just shy of £6m profit from Blackpool FC on that land deal. Together with his £11m, that makes £17m from the relegation year to Oyston. A wide range of other Oyston companies do business with Blackpool and the club’s parent company, Segesta, and a variety of payments pass back and forwards between them.